Flabby arms often seem to come out of nowhere, but their cause is likely due to changes occurring in the body throughout adulthood. 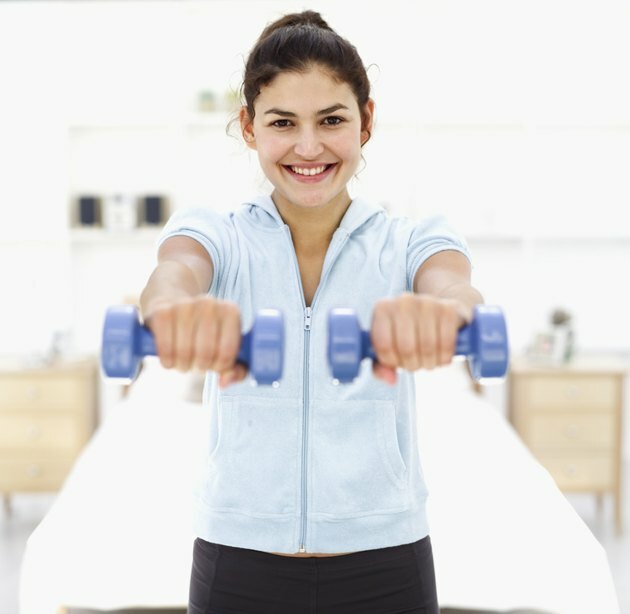 There are ways to combat and tighten flabby arms, however, including incorporating both regular strength training sessions and cardio workouts. The major muscles in the arms include the deltoids, biceps and triceps. The deltoids are the major muscles in the shoulders and are responsible for lifting the arms up forward and out to the sides. The biceps brachii runs down the front of the upper arm and is in charge of bending the elbow joints against resistance. The triceps, on the back of the upper arms, overcome resistance to straighten the elbow joints. Incorporating strength training exercises can help develop muscular tone and thus tighten the upper arms. It's important to note that strength training doesn't make an impact on any excess fat tissue, but it develops the lean muscle underneath the fat. Incorporating two to three strength training workouts into a regimen can effectively develop muscular tone, whether using body weight exercises, free weight exercises or working out at a gym on strength training machines. Exercises like shoulder press, close grip pushups, close grip bench press and bench dips are effective at targeting both the shoulders and triceps. Use biceps curls, chin-ups or underhand pulldowns to develop your biceps. To focus on building tone, do two to three sets of six to 12 reps each. The muscle tone built with strength training won't be visible if there's excess fat on the arms. Cardio exercises are effective at burning a high number of calories and thus supporting fat loss; incorporate cardio exercises that call for heavy arm involvement. Swimming, for example, burns calories and also forces the arms to help propel the body through the water. Elliptical machines with the moving arm units require the major arm muscles to contribute. The Center for Disease Control and Prevention recommends getting in a minimum of 150 minutes of moderate-intensity cardio or 75 minutes of vigorous-intensity cardio per week, but adds that 300 minutes of moderate-intensity cardio or 150 minutes of vigorous-intensity cardio per week provides significantly greater benefits.